"If I had used a tool rather than Alpha Anywhere, it would have taken me twice as long to launch Fast Mirror, and possibly miss a market opportunity." 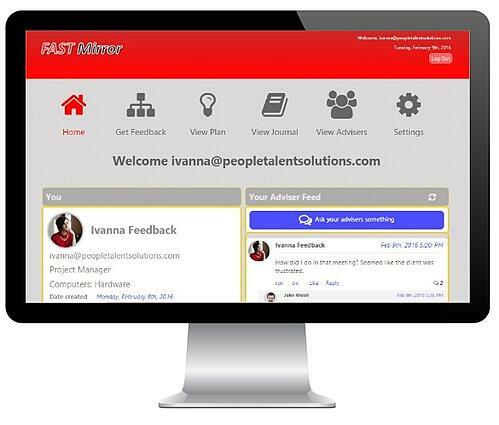 Fast Mirror is a cloud-based platform for the human resources industry. It allows employees to get feedback from their colleagues on how they're doing and create a growth plan in response to that feedback. It addresses many of the challenges Human Resources organizations are currently struggling with such as low levels of employee satisfaction with performance appraisal, a need for increased employee feedback, and a need to provide employees with actionable, meaningful resources for their professional development. Fast Mirror founder John Azzara has a background in industrial/organizational psychology and has extensive leadership experience in human resources. In 2006 he founded his consulting company, People Talent Solutions (PTS), a provider of technology and consulting services, after working for years as an internal consultant in a variety of Fortune 500 companies. He developed several HR technology products for PTS clients who needed customized, low-cost solutions. His clients have spanned many industries including financial services, hospitality, biotech, manufacturing, retail, and automotive. Azzara wanted to build a self-service Software as a Service (Saas) solution for clients that would help human resources organizations address some of the challenges they are currently facing with performance feedback and professional development. In many organizations employees are looking for more feedback than they usually receive in the annual performance appraisal discussion. When they do receive feedback, they need help coming up with a plan to address the areas they want to work on. He also wanted to help reduce the administrative burden traditional feedback and development processes have imposed on HR organizations. Fast Mirror addresses these problems. Azzara is a self-taught developer as well as a human resources expert. His background was in VBA, VB.net, and C# . He has experience with other development platforms including The Force, Salesforce's developer platform, and Visual Studio, but none of them provided what he needed. "None of them were really right," he says. "Salesforce would have caused problems with its pricing, and wasn't flexible enough. None of the other platforms offered the right balance between ease of use and hand-coding." He came across Alpha Anywhere, and found its coding-optional approach ideal for what he wanted to do. "When I discovered Alpha Anywhere, I was very impressed with its low-code approach," he says. "With it I can build what I want in just a few clicks, and when I want something more advanced, I can write the code myself." He built the Fast Mirror subscription-based service by himself, including the SaaS framework, and made considerable use of CSS and Alpha Anywhere's list control. He finished the work in half the time than if he had used a competing product. Fast Mirror can utilize API's of existing platforms to integrate information. "If we had to build the core from scratch, it would have taken three times as long. But with Alpha, we made our May 1st deadline." Azzara gained significant benefits by building Fast Mirror using Alpha Anywhere rather than a competing solution, including reduced costs, improved productivity, and faster time to market. "If I had used a tool rather than Alpha Anywhere, it would have taken me twice as long to launch Fast Mirror, and possibly miss a market opportunity," Azzara says. "And if I had wanted to keep the same timeline as I had with Alpha Anywhere, but used a different platform, I would have had to hire developers to help me build it, at a considerable cost." The finished SaaS service was superior to what it would have been if he had used another tool, he says, because Alpha Anywhere let him build prototypes quickly, allowing for fast iterations. He is currently working on building a mobile-web version of the service using Alpha Anywhere. Summing up his experience with Alpha Anywhere, he says, "The best thing about it is that it lets you focus on what you want to get done, and takes care of a lot of manual work for you. It's as if I were building a house, and I could just build the part that I'm going to walk around in, and have someone else take care of the plumbing." If I had used a tool rather than Alpha Anywhere, it would have taken me twice as long to launch Fast Mirror, and possibly miss a market opportunity.